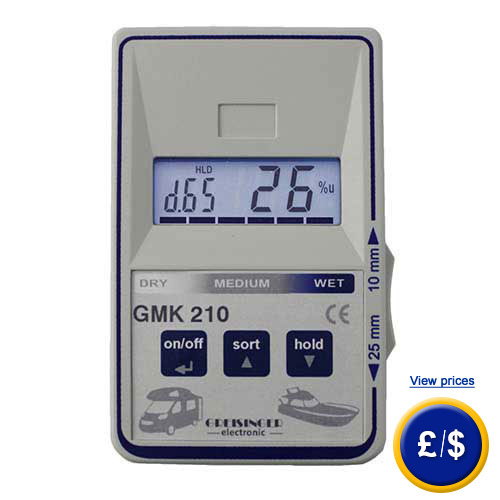 The caravan moisture meter is the ideal tool to quickly locate moisture not only in buildings, but also on boats or in caravans. The measuring method of the Caravan moisture meter works absolutely non-destructively. The evaluation simultaneously occurs both acoustically and visually. The caravan moisture meter is simply held against the surface which is to be examined. The non-contact capacitive measurement process can determine whether there is increased moisture up to a depth of about 25 mm and thus if a more detailed investigation is required. If you have any questions about the material moisture meter, please take a look at the following technical data or call our hotline: UK customers +44(0) 23 809 870 30 / US customers +1-410-387-7703.Our technicians and engineers will gladly inform you on the Caravan moisture meter and any other product in terms of regulation and control, or scales and balances of PCE Instruments. - To quickly find wet spots, etc.